August and thus anniversary time again. Deb & I celebrate on the 27th. Lots of years now. Often we take a little trip and get away. This year we stayed home but spent 2 days doing activities together. I am happy that Deb will join me on my usual outings. We climbed up Cedar Canyon. Went to a Shakespeare play in the evening (Taming of the Shrew) which was particularly good this year. A fun morning lake run at Sand Hollow followed by a wet canyoneering trip down Pinecreek Canyon in Zion. Oscar's was too busy so we settled for some pizza at Zion Pizza and Noodle. Nice hot summer weather. I finally made it the Bugaboos. This mountain range is found in British Columbia of Canada. 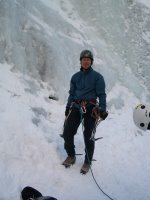 It is well known to alpine climbers and photographs of the peaks and spires entice climbers from all over the world. I attempted to climb there last summer but a bad weather forecast foiled our plans and I ended up climbing in the state of Idaho. This year I drove north with two climbing friends. Dave Smith and JJ Cieslweise. We did the drive over 3 days. Staying one night with my brother Clair in Hayden Lake, Idaho at his comfortable and beautiful home. The weather was clear as we hiked in with heavy packs up the steep trail towards the climbing hut. The Conrad Kain hut can hold up to 35 people when full. It was full during our stay up in the Bugaboos. We slept on pads on the upper loft of the cramped yet cozy hut. The next morning we were one of the first climbers to get going. We were soon hiking on the glaciers below the granite spires. We found the glaciers to be challenging with many exposed crevasses and our route finding was not a straight line as we weaved back and forth looking for the safest way to avoid or cross the crevasses. The weather was perfect as we climbed along the West Ridge of Pigeon Spire and stood on its striking summit block. Our climb that day took us ten hours. The following day the weather forecast was grim. A stormy system was supposed to hit the area around noon and settle in for at least two days. Nevertheless, JJ and I attempted a 6 pitch route on Crescent Spire called the McTech Arete. As we hiked early in the morning up to this route the skies were clear and the mountains beautiful. The first two pitches were on excellent granite and were challenging and aesthetic. At the the top of pitch two on a ledge we saw the first clouds touching down on the peaks. We made a decision to descend. As we got back to the ground at our packs the storm came crashing in with lightning, thunder and strong winds. I was completely soaked as we stumbled back in the hut. With the less than ideal forecast we made the decision to end our climb in the Bugaboos a few days early and we hiked down still with heavy packs. The next few days were spent traveling back into Idaho and down to the City of Rocks. There we found perfect weather and great climbing. The granite faces and cracks of the domes there are a delight to climb and the campsites are enjoyable with great vistas and clear star filled skies. Soon enough we had to make the drive home to St. George. It was such a contrast as we opened the door to the truck in my driveway to experience the summer temps of 108 degrees! The Bugaboos were impressive and elusive. Still a fun and rewarding climbing trip. Yesterday Deb & I decided at the last minute to do Mystery Canyon. I am getting ready to travel to BC, Canada to do some mountaineering and climbing and thought that a good hike with a backpack would be a good idea to prepare my body for the steep approaches in the mountains. It was just the two of us as we drove over to Zion on a sunny Saturday in August. My ranger friend Andrew met us at the EOC and he had my permit ready and gave us a shuttle up to the Weeping Rock trailhead and dropped us off. Usually we drive or shuttle up to the east side of Zion and hike a short mile over to the head of Mystery Canyon. This day we decided to hike up the Observation Point Trail and gain access to the canyon without the shuttle. This took us 2 1/2 hours and several thousand feet of vertical gain to accomplish. A good workout! Deb did really well on this part of the day. It had rained considerably the day before so we encountered slippery and muddy conditions as we dropped into Mystery Canyon. This made the first descent into the canyon rather tedious and unfriendly. Soon we arrived at the first rap and the fun began. Only did we see another person as we bumped into and passed two other canyoneers at the Mystery Springs rap. The final rap into the Narrows was fun. Gops of people watched us drop down the falls. We were astounded at the number of hikers in the Narrows that Saturday afternoon. The line to get back onto the shuttle bus numbered around 3-4 hundred people! We decided to hike down to the next shuttle stop (Big Bend....about 1 1/2 mile down canyon) in order to bypass the line and get on the packed shuttle (good idea in the end). A dinner stop at Oscars then followed and a slow tourist drive back to St. George as we talked about all the things going on in our lives and our children's lives. It sure was nice to just hang out with Deb all day. She sure has come a long way since the first day I took her rappelling and down a canyon. Now she has become a competent and fun canyoneering partner. She may not know it but I think she is ready for some bigger and more challenging canyons!